Are you or someone you know gluten-free? Click here for perfect gluten-free chocolate chip cookies. Or make the perfect gift – perfect chocolate chip cookie mix in a jar! 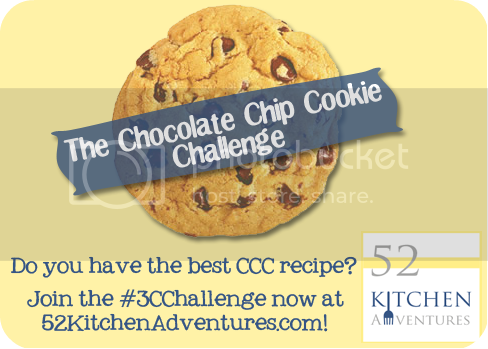 When I first came up with the Chocolate Chip Cookie Challenge, it wasn’t because I had an awesome chocolate chip cookie (CCC) recipe I wanted to show off. In reality, I didn’t even have a go-to recipe. That just doesn’t seem right for such a classic dessert! I challenged six other food bloggers to share their favorite CCC recipes with us. Once their posts started coming in, I just wanted more, so I opened it up to the public and hoped that it would get people baking. And then I realized…I should probably be sharing my favorite CCC recipe too! So the challenge did get at least one person baking – me! I did a lot of Googling and kept coming across the same recipe over and over. Have you heard of the New York Times’ chocolate chip cookie recipe? I’d read about how it was supposed to be the perfect CCC recipe and mentally added it to my to-bake list, but never got around to it. Then I found it on all sorts of great blogs: Tidy Mom, Recipe Girl, The Little Kitchen, Good Life Eats, Two Peas and their Pod. They all said the cookies were excellent, even if some weren’t prepared to call them the best ever. I am prepared to call them perfect chocolate chip cookies. What makes a perfect CCC? A thick, soft, cookie with a crispy edge and lots of chocolate chips. These have a sprinkle of sea salt on top which enhances the sweetness. I love how these come out really soft and almost like they’re slightly undercooked in the middle, but still have a nice crisp when you first bite into them. The recipe has a few unique traits, one of which you need to know up front: it recommends you refrigerate the dough for 24-36 hours. I know, that is a long time to wait for cookies. As you can see in the photo below, there is a noticeable difference between baking immediately and waiting a bit. They spread less, making a thicker and softer cookie, and also brown more evenly. Letting the dough rest allows the dry ingredients to soak up the wet ones and gives a better consistency. Apparently even the original Toll House recipe chilled the dough overnight. Here’s the thing: I didn’t taste a huge flavor difference. The cookies are supposed to have a “richer, more sophisticated taste, with stronger toffee hints and a definite brown sugar presence.” I didn’t get that, but I did like the overall result in texture and flavor. I think I’ll try refrigerating for just a few hours next time and see if that’s enough. The recipe also calls for 3.5 ounces of dough – the size of a “generous golf ball.” I tried using 3.15 ounces, which made huge 5 inch cookies that were a little big for me (above you can see one – on a dinner plate!). I ended up trying 2 ounces, which still had a crispy edge and a thick, soft middle, without being too much to eat in one sitting. So you’ll need a few things for this recipe – a kitchen scale will certainly help you, but if you don’t have one, just try to make them all the same size (a bit smaller than a golf ball). I love my cookie scoop and it’s just about the right size for these. These nonstick baking mats are great for any baking (although parchment paper works too). Finally, instead of all purpose flour, you’ll need bread flour and cake flour. Oh, and you’ll need patience, but unfortunately you can’t really buy that. My final tip for you – when you add a sprinkle of sea salt, add some additional chocolate chips on top of the ball of dough (as seen above). I learned this from Recipe Girl and I’ll never make CCCs again without doing it. It makes them look picture perfect! In a large bowl, combine both types of flour with baking soda, baking powder and salt, and set aside. Using a stand mixer with a paddle attachment, cream butter and both types of sugar together on low/medium speed (I was on 4) for around 5 minutes (until mixture is very pale in color). Add chocolate chips and stir with a large spoon until they are distributed throughout dough. Cover the bowl with plastic wrap, pressing it against the top of the dough. Refrigerate for 24 to 36 hours. When ready to bake, preheat oven 350°F and line a baking sheet with a silicone mat or parchment paper. Scoop dough onto a kitchen scale until you have 2 ounces. Transfer to prepared baking sheet. Sprinkle with a dash of sea salt. Optional: Press several chocolate chips onto top for a picture-perfect cookie. Bake 15-18 minutes, until light golden brown. Place cookie sheet onto a wire rack for 10 minutes. Repeat baking steps with remaining dough or refrigerate and bake remaining batches later. Dough will keep for up to 72 hours from when it was prepared. Almost all my drop cookies get dished out, then stuck in the freezer for about five minutes before baking. You might try that and see if you get the same result — it’s usually the only way my cookies don’t spread out too thinly. @Traci – that’s a great idea! Thanks for the tip. @Ellen – I love bittersweet chocolate in them too. I’m glad you enjoyed the post. I learned a lot from this challenge too! Wow, Steph, you really did a stellar job with this post! I almost didn’t read it because I thought it was “just another chocolate chip cookie post”, but you’ve got some great information here! Thanks – never thought I’d pick up new chocolate chip cookie tips! @the wicked noodle – thank you, Kristy! I’m so glad you enjoyed the post. I learned a ton from this challenge! Frozen cookies dough normally helps. I make dough balls and then freeze. Not only do I only bake off a few at a time, they are always enjoyed fresh and warm, but they seem to bake much better. @Emily – I’ll have to try that. Do you de-frost them or put them straight into the oven from the freezer? I have some extra dough from this recipe in my freezer and I can’t wait to bake some more cookies! Wow! Chilling the dough and arranging chocolate chips on top – I’d never have thought to do either of those. Your cookies are beautiful, the epitome of the CCC. Thanks for the tips and the challenge as well – I agree that it’s been a great learning experience! I made these cookies in June, and they were SO good! Worth the effort I think! @Jill – I agree! They’re worth the time and wait. I think next time I’ll freeze half the dough so I can have them ready anytime without all the waiting. They certainly do look picture perfect! I will have to try this recipe after your review of it. I have had it on my list, but kind of on the back burner. After paging through this and all the pictures though, I have a serious craving for cookies! Thank you so much for such great tips! I love the idea of adding sea salt and chocolate chips on top of the cookies! @Alexandra – they definitely add that extra special something. I’ll never make CCCs without putting the extra chips on top again! I love the sea salt and extra chocolate chips on top! No wonder these are the perfect cookie! @Laura – it’s the little things that really make the difference! I love a cookie that has LOTS of chocolate chips. That’s the best part! I used this recipe today and it ended up as a disaster. They tasted really delicious, but they ended up spreading out so thinly, and the edges were hard as rocks. I know I didn’t over cook them because after a minute in the oven they immediately flattened out. I really want to try this recipe again because it tasted so good, but I don’t want them to be so thin and rocklike. Any ideas on how to prevent this? AJ, was the dough at room temperature or chilled? How long did you refrigerate it for? The longer I left I my dough in the fridge, the less it spread. It was also cold when I baked it, which should prevent further spreading. AJ, that should be more than enough time in the fridge. The problem might be one of your ingredients or how you put the dough together. Make sure everything (especially baking soda, powder, and flour) aren’t expired and that you’re creaming the butter as described. Second time’s the charm – hope it comes out better next time! They look amazing. Am I supposed to use room temperature butter? When dropping dough onto baking sheet, how should the dough be? If I were to use an ice cream scoop, do I flatten the cookies, or leave them as is? Alise, that’s just what the NYT found to make the best chocolate chip cookies. You can use AP flour but it won’t have the same end result, as each kind of flour has different amounts of protein. These were, in a word, AMAZING. They turned out fabulous and tasted even better. I’ve made them twice now and each time was a success. These are SO much better than any other CCC recipe I’ve used and it shocks me that something this yummy and amazing came out of my kitchen (apparently so were others since I got comments like, “you made these?!”). Thanks for making me look like Betty Crocker reincarnated! Oh, by the way, I followed the recipe EXACTLY using my kitchen scale to get it correct to the ounce. Could I recommend you replace the cake flour with whole wheat flour and the bread flour with all-purpose (cooking time would need to be 9-10minutes)? I’ve done your recipe itself (and it was amazing), but ran out of the proper flour the second time through. I had those two on hand, and that modification makes it my most popular recipe. Thanks for the recommendation, Carolina – I can’t wait to try it! Hi, i live in the uk. I’ve never heard of cake flour only plain flour and self raising flour. I really want to try this recipe. What can I do please help. Hi Thepa, bread flour has a slightly higher protein content than all-purpose flour. If you can’t locate it, you can replace with plain all-purpose flour. but seeing these cookies has convinced me to practice patience.